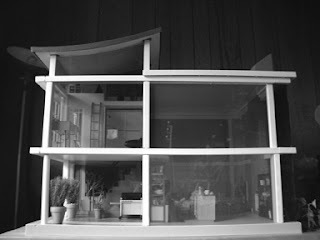 My obsession with modern miniature dollhouses started decades ago when I received the Tomy Smaller Homes dollhouse and sets. Wow! I didn't even know that I liked miniatures, but something about that tiny modern family and accessories set my imagination on fire. I, of course, played with it roughly and broke several parts, but I never forgot it. When I saw the Kaleidoscope House by Bozart Toys in 2000, my fascination with mini modern was re-awakened--and since I was an adult, I was financially able to indulge in that passion. I will share the many room settings that I have created, the furniture that I have collected and all the fun and some disappointments in searching for quality modern miniature architecture, furniture and accessories. Many shout-outs to people who share my interest...and even to those who don't. Ha! P.S. I did secure that Tomy Smaller Homes dollhouse again--MIB with all MIB accessories.